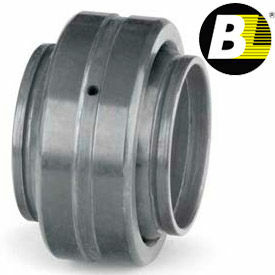 Bearings Limited GE Series Spherical Plain Bearings Are Made Of A Single Fracture Design For Increased Durability. Bearings Limited GE Series Spherical Plain Bearings have a steel-on-steel sliding surface and are treated with MoS2(Molybdenum Disulfide) to reduce friction. 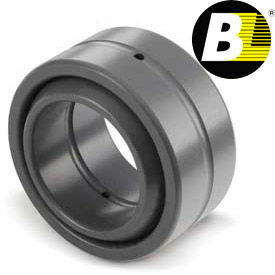 Oil holes inside rings and annular grooves for lubrication.Bearings Limited GE Series Spherical Plain Maintenance-Free Bearings require no additional lubrication and provide long-lasting durability. Sliding surface is PTFE-lined steel outer on chrome-plated ball to prevent corrosion. Dimensions and angle of misalignment vary per model. 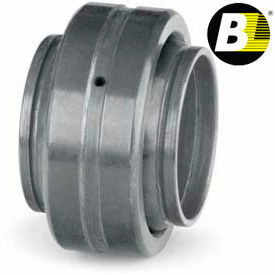 Bearings Limited GEM Spherical Plain Bearings Carry High Capacity Axial And Radial Loads For Industrial Applications. 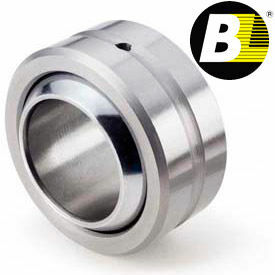 Bearings Limited GEM Spherical Plain Bearings are made of steel for long-lasting durability. They feature Molybdenum Disulfide (MoS2) treatments for reduced friction. 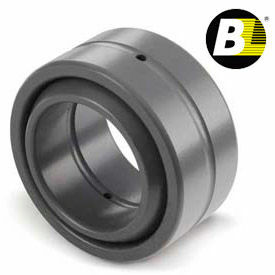 Spherical plain bearings contain oil holes inside the bearing rings and annular grooves to provide lubrication. Extra-wide inner ring eliminates the need for spacers. Dimensions and misalignment angles vary per model. Bearings Limited GEG Series Spherical Plain Bearings Are Made Of A Single Fracture Design For Increased Durability. Bearings Limited GEG Spherical Plain Bearings have a steel-on-steel sliding surface and are treated with MoS2(Molybdenum Disulfide) to reduce friction. Oil holes inside rings and annular grooves for lubrication. Extended inner ring eliminates need for locational spacers. 4 degree maximum angle of misalignment. Dimensions vary per model. 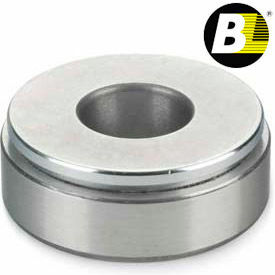 Bearings Limited COM Series Spherical Plain Bearings Are Made Of A Steel-On-Steel Sliding Surface And Chrome-Plated Ball To Prevent Corrosion. Bearings Limited COM Series Spherical Plain Bearings can be lubricated through annular grooves and oil holes inside inner ring. Dimensions and angle of misalignment vary per model. Bearings Limited GEH Series Spherical Plain Bearings Are Made Of A Single Fracture Design For Increased Durability. Bearings Limited GEH Series Spherical Bearings have a steel-on-steel sliding surface and are treated with MoS2(Molybdenum Disulfide) to reduce friction. Wider inner ring and larger OD allow greater misalignment.Bearings Limited GEH Series Spherical Plain Maintenance-Free Bearings require no additional lubrication and provide long-lasting durability. Sliding surface is PTFE-lined steel outer on chrome-plated ball to prevent corrosion. Dimensions and angle of misalignment vary per model. Bearings Limited GEZ Series Spherical Plain Bearings Are Made Of A Single Fracture Design For Increased Durability. 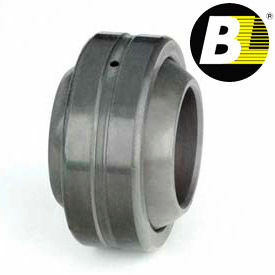 Bearings Limited GEZ Series Spherical Plain Bearings have a steel-on-steel sliding surface and are treated with MoS2(Molybdenum Disulfide) to reduce friction.Bearings Limited GEZ Series Spherical Plain Extended Bearings eliminate need for locational spacers with extended inner ring. 5 and 6 degree maximum angle of misalignment available. Dimensions vary per model. Bearings Limited GX Series Spherical Plain Bearings Support Single Direction Axial Loads Or Combined Axial And Radial Loads For Increased Versatility. Bearings Limited GX Series Spherical Plain Bearings have a PTFE-lined outer on chrome-plated ball to prevent corrosion. Maintenance-free design reduces friction and requires no additional lubrication. Angle of misalignment ranges from 3-6 degrees. Dimensions vary per model.